High/low kitsch is nothing new. We're into the whole sneakers-with-a-ball-gown thing. We love to watch celebrities eat Burger King. Apparently, drinking wine out of a 40 is a pleasurable novelty. 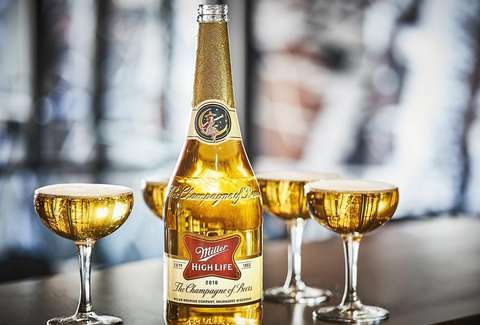 And our latest gimmicky holiday innovation is more of the same: this season, you can get your favorite brand of watery lager, Miller High Life -- better know as "the Champagne of beers" -- in an actual Champagne bottle. While the luxe supper time edition of Miller has been on offer in this pristine packaging previously, the stuff only went on sale in Milwaukee and Chicago, per a report by Food & Wine. Starting this month, however, they'll be available nationwide for just $3.49 a pop. Speaking of which: It's important to note that the bottles do not, in fact, pop -- they may look like your standard sparkling wine, but they'll be sealed with a classic beer cap. Take this into account if your New Year's plans include "popping bottles." Miller High Life says the bottles should be fairly easy to locate -- they'll be available across the country in your standard roster of bodegas and liquor stores. Still, the company has only released enough bottles to last through the holiday season, so you'll have to stock up now, then make a small fortune later this year by selling extras on eBay. The bottles themselves are something of a hybrid between a 40 and a classic wine bottle, which feels discernibly on brand. The label, which clarifies that this is a "2018 blend," is that much shinier on the elevated packaging, though the graphics are identical to those on your normal six-pack. Whether you take the whole "Champagne of beers" shtick ironically or not, you will look undeniably classy while slugging 750ml of liquid gold from one of these holiday edition bottles. Eliza Dumais is the beer of Champagnes. She is also a news writer at Thrillist. Follow her on Twitter.